***Update 8/2/2018: It seemed when SSR withdrew their application for exploratory drilling that we were in the clear. operation, and BLM granted the claimants 60 days to complete the transfer requirements. Picture this: a gold mine on Conglomerate Mesa. A dusty cyanide heap-leach mine where there is now a quiet, culturally rich, open space filled with Joshua trees. All on Death Valley’s doorstep. It almost happened. In mid-May, Silver Standard Resources Inc. (SSR) was given the green light to explore for gold via drilling at Conglomerate Mesa. We believe the approval of the project failed to adequately analyze the effects of the proposed drilling, and so we challenged it. We filed a Request for Review by the State Director of the Bureau of Land Management. Shortly thereafter, SSR withdrew their application for exploratory drilling on Conglomerate Mesa. Together, we can continue fighting dirty mining in breathtaking places. Please join Friends of the Inyo today. Friends of the Inyo and a coalition of groups and individuals educated and organized Eastern Sierra community members to send the message that an industrial-scale mine on Conglomerate Mesa would not be welcome. By filing the request for State Director review, we showed SSR that we would not back down, and were serious about the health and future of our public lands. But the fight is not over yet. BLM has informed us that the claim holders on Conglomerate Mesa wish to find another mining company to take over the approved project. Help us continue to care for the Eastern Sierra’s public lands. Become a member of Friends of the Inyo today. 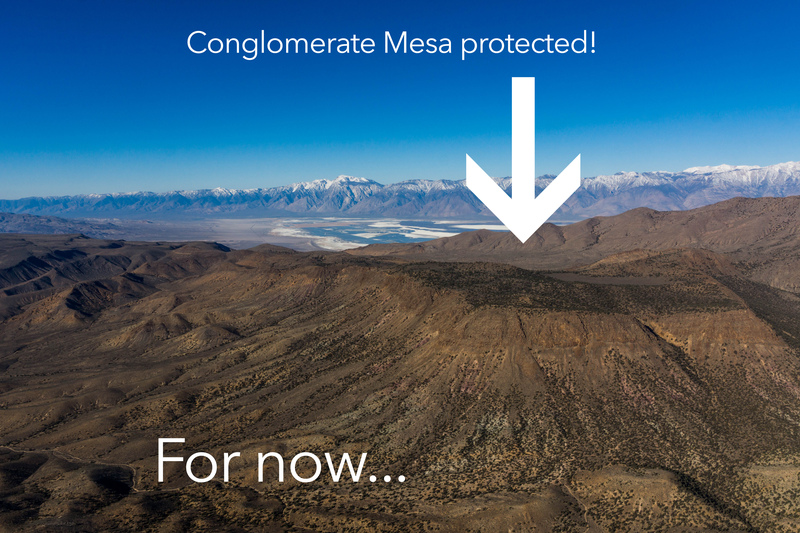 Ultimately, what we are targeting is permanent protection for Conglomerate Mesa. So long as the area lacks protection, the claim will get passed from one mining company to another. And the threat of mining will loom over this rich landscape on the border of Death Valley National Park. Conglomerate Mesa deserves Joshua trees, not drill holes a thousand feet deep. Death Valley’s Doorstep deserves quiet nights with a blanket of stars so bright they illuminate your view of the Sierra, not noise and light pollution around the clock. The wild, stunning public lands of the Eastern Sierra should be cared for. There is no place for a cyanide heap-leach mine on our public lands. With your support we can be ready for the next attempt to drill at Conglomerate Mesa, the next affront on our public lands. and become a member of Friends of the Inyo today. Thank you for rising to the call to action.